The World of Smalltalk (www.world.st) website has been changed. Nice - it includes more infos now. Janko has Aida 6.5 ready. The webframework now also includes support for OpenID authentication and OAuth authorization. By default it includes support for JQuery, Twitter bootstrap and Amber. You want to run Seaside 3.1 already on Pharo 2.0 (both not yet released) to work on the bleeding edge versions. Here is how. Lars has some news on his GSoC project on JITting on ARM. With his VM Plugin for the Cog VM it should be possible to enable debugging and simulation of the ARM-JIT. The "Zinc HTTP Components" framework for Pharo will support WebSockets in the near future. An initial implementation is already available as Sven (the author of Zinc) announced today. Thanks to a financial incentive (from Andy Bernett from Knowinnovation) Sven is now sponsored to implement it in an open source way and release the code with MIT license. Ahh ... Bootstrap 2.1. is out! Nice! There is CodeCity written in VisualWorks. Looks like there were some issues with licensing for commercial use. Now there is a similar tool called "SourceCity" for Pharo. "Now we are developing since more than six months a replacement from scratch but it will not be open-source. Interested people will be able to contact us and we will license them the software." Sad - it would have been a nice example for using NativeBoost. But meanwhile Igor wrote some documentation for NativeBoost using the HelpSystem. 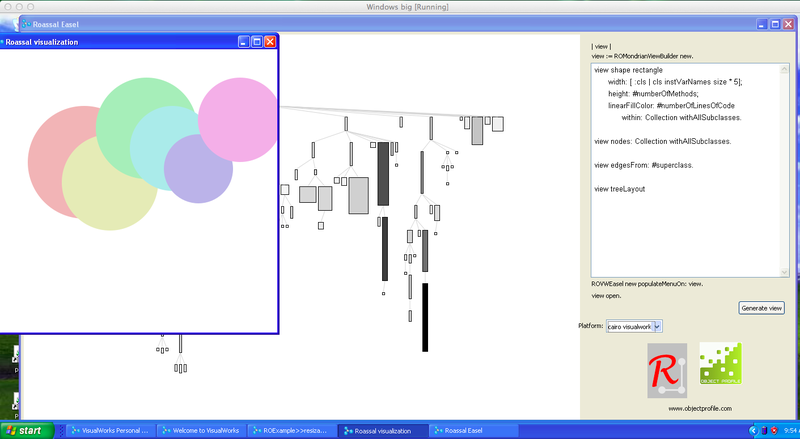 Read about "Object Centric Debugging" here or watch the teaser video for ICSE2012 here. There is a new video about the Roassal visualization engine available. It also includes a preview of the port to Amber (to run client side in the browser). Marino explains the Tanker package transporter which is based on Fuel. Read about it here or try the image/watch a screencast here. Craig released Spoon 3 alpha 4. Maybe next Web based IDE's are built using Dart language. JNIPort (which can be used to call Java from Smalltalk) is now available for VisualAge Smalltalk as well. Now there are two new CI jobs running at INRIA providing you a standard and a Cog VM for Android. This allows to run applications written in Pharo on mobile devices. There is also a good documentation. Rob has a nice page with clippings from Smalltalk. The Pharo/Squeak VM Maintainers now have an own blog related to VM building an stuff. Pharo now finished switching from old "FileDirectory" to the new "FileSystem" for the not yet released Pharo 2.0. Expect a much cleaner API covered with many tests. I'm sure people may lament that Pharo is too radical and not backward compatible - but Pharo's vision can only be accomplished if the platform moves forward quickly, throws away ugly code and gets cleaner and cleaner. I switched some of my packages to the new Filesystem, others from ReferenceStream (which is also removed in 2.0) to its replacement "Fuel" very easily. The quality and maintainability is much better and I'm sure we are on the right track. The "Altitude" webframework is presented by Colin Putney at the next Vancouver Smalltalk Developer Group meeting. Old video (1 year ago) but nonetheless interesting. They also work on an Amber version to be able to run in the webbrowser. Nice!